The AWB crew were paged when a small day boat contacted Holyhead Coastguard that they had engine failure, 1.5 miles north of Prestatyn. The AWB was at the water’s edge ready for launch when the boat reported they had restarted their engine and were slowly getting back to shore. The crew stood by until it was reported the boat had made it safely to shore, and the crew were then stood down at 1350. Classed as standby. The AWB crew were paged after a crew member on a work vessel 5 miles off Rhyl, reported they were not feeling well. The AWB launched and met up with the vessel 4 miles off Rhyl. The casualty was transferred to the lifeboat and returned to shore to be handed over to an ambulance crew. The lifeboat was ready for service by 0355. The AWB crew were paged to assist with the medical evacuation to hospital, of a technician on a local windfarm, 5 miles off Rhyl, who had suffered a foot injury. The AWB launched and met up with a support vessel who had managed to get the casualty off the wind turbine and on to their boat. 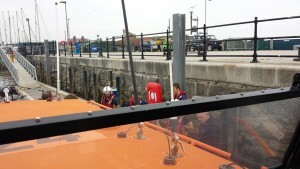 Crew members transferred from the lifeboat to the support vessel, and rendered first aid and casualty care to the person. The casualty was put in a stretcher and transferred on to the AWB, and then the lifeboat returned to Rhyl to a waiting ambulance. Rhyl AWB launched after the Windfarm Accommodation vessel “Wind Solution” reported they had a sick person on board who required immediate evacuation to hospital. The RAF helicopter from Valley, Anglesey, was also tasked. Both units arrived on scene at the same time. The lifeboat stood off as the helicopter winchman was lowered to the boat’s deck. 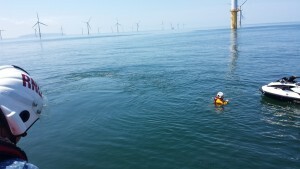 The casualty was assessed by the winchman and the emergency response team from the windfarm. The casualty was assessed as OK to be winched up and so the lifeboat crew again stood by as the casualty was winched into the helicopter and taken to hospital in Rhyl. The lifeboat was then stood down and returned to station at 1130. The AWB crew were paged after Holyhead Coastguard received a mobile phone emergency call from the crew of a 28-ft long Westerley yacht, nearing Rhyl harbour, who had lost all engine power. The AWB was launched within ten minutes of the initial call, and was alongside the yacht some ten minutes later. 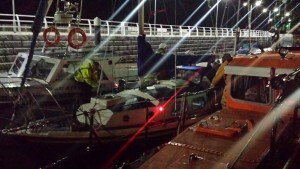 The two people on board the yacht had managed to deploy the anchor to keep the vessel safe as the lifeboat approached. Two crew members were transferred to the yacht from the lifeboat and helped to secure a tow line. The tow then started towards Rhyl harbour, which was the yacht’s destination port.The yacht was safely taken to the safe haven of the outer pontoons at Rhyl harbour, where it was secured by the Harbour Master and his team, together with local coastguards. The lifeboat crew then returned to station, recovering about 2345. AWB pagers set off after a Jet skier found an abandoned dinghy with a fishing rod, flip flop and bottle of coke in it, about 3 miles off Rhyl. The boat launched and met up with the Jet skier and took the dinghy on board. Holyhead coastguard requested the AWB and ILB to search the local area, together with nearby wind farm boats and the RAF helicopter from RAF Valley, Anglesey. A comprehensive search was carried out over a large area for several hours. as no-one had been reported missing, the search was called off by Holyhead Coastguard and the lifeboat was released to return to station, getting off Rhyl at 1505. Crew heard a MAYDAY on the distress channel from a yacht 7 miles out, with a failed engine and damaged sails. The lifeboat proceeded to the position as wind farm support boats stood by. A tow was started to Liverpool, and the Coxswain requested Hoylake lifeboat to launch to take over the tow for the final leg to Liverpool marina. This was successfully completed at the entrance to the river Mersey and the lifeboat then returned to station at 1745, nearly 7 hours after launching. AWB brought to immediate readiness to assist in a search after a radio beacon transmitted a distress signal. The alert was from a personal locator beacon (PLB). 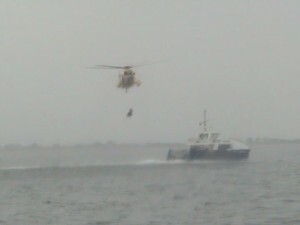 Moelfre lifeboat and the RAF rescue helicopter were also tasked. Direction finding equipment pointed to the source on a north-north-westerly direction from Rhyl. Holyhead Coastguard also transmitted a safety message on the marine calling channel, and this resulted in the skipper of a wind farm support vessel off Rhyl contacting the coastguard, to say that a PLB on one of the lifejackets on his boat had been accidentally triggered. This had now been reset and no further signals were received either at Holyhead coastguard or on Rhyl lifeboat’s direction-finding equipment. The lifeboat was stood down at 0930. The helicopter took one final sweep over the area but nothing was found. Classed as standby. The AWB was launched to a medical evacuation from a wind turbine about 7 miles offshore. The casualty had chest pains. A windfarm support vessel had managed to get the man on board their vessel and they then proceeded towards Rhyl. The lifeboat met up with the support vessel about 3 miles off Rhyl, just before the rescue helicopter from RAF Valley, Anglesey. the lifeboat stood off as the winchman was put aboard the vessel. After an assessment by the winchman, the male could be winched up, and so the man was evacuated by helicopter to Ysbyty Glan clwyd. the lifeboat crew were then stood down, returning to station at 1430. The AWB was paged to launch to assist the 2-man crew of the leisure fishing vessel “Cal’Lou” which had suffered an engine seizure off Towyn, about 3 miles west of the station. The boat was launched, and was on scene some 20 minutes later. A crewman was transferred to the casualty to assist with the tow line and a tow was started back to Rhyl harbour. The casualty was safely moored on the outer pontoons at Rhyl harbour with the assistance of the local coastguard team, and the lifeboat returned to station by 2145. The ILB was paged; and half an hour later the AWB was paged; to support police who had reported a male leaving an accident near the town centre, running on to the beach, and into the water. Local coastguard teams from Rhyl and Flint were also tasked. Both boats searched the River Clwyd into Rhyl harbour. It was thought that the male could be hiding in the voids around the rock groyne marking the river entrance. The ILB crew found an article of clothing on the estuary bank, and this was confirmed as being from the male. After about 1 hour’s searching, including using parachute flares, fresh footprints were spotted coming out of the water and going towards a local holiday camp. After a further period of time, police determined the person was now ashore, and both boats were stood down, returning to station at 0345. A yacht was being sailed overnight from the Menai Straits to the Wirral. The skipper was sailing single-handed, but was not making good time, so he tried to start his engine. This failed, and all the other navigational and electrics failed at the same time. The skipper had been sailing all night and was very tired, so he dialled 999 on his mobile phone for assistance. He was approximately 2.5 miles NNW of the lifeboat station, and so Holyhead Coastguard requested the AWB to attend. The pagers were set off, and the lifeboat was alongside the casualty within 15 minutes of launching. 2 crew members were put on board to assist the skipper in taking down the yacht’s sails, then a towline was passed, and the lifeboat crew then towed the casualty into Rhyl harbour, putting the yacht on the pontoon on the outer harbour entrance, where local coastguard officers and the harbour officials were waiting to secure the yacht. The skipper was tired but otherwise unhurt, and so the lifeboat crew made sure everything was secure and OK with the skipper, then returned to station at 0810. NEWS RELEASE WITH PHOTOS AND VIDEOS. Both boats were launched after a member of the public spotted a wind surfer about 1.5 miles out from Llandulas, sitting on his board for some time. The local Rhyl coastguard was also tasked. The ILB came up on the man, now about 1 mile out. He was taken on board the ILB but wanted to bring his board back. This was too much for the ILB crew, and so the AWB carried on and rendezvoused with the ILB. The man and his board and sail were taken on board the AWB from the ILB, and taken to within 200m of the shore from where the man started off. The ILB then ferried the man and his equipment ashore to waiting coastguards. The boats then returned to station, arriving at 2020. Holyhead Coastguard requested the AWB to launch to an injured worker on the offshore windfarm transformer platform, 8 miles out from Rhyl. The crew were already at the boathouse and the boat was launched within 5 minutes. After 30 minutes, the lifeboat came alongside a windfarm supply vessel that was alongside the platform. the injured man was taken on to the supply vessel and then transferred to the lifeboat. A further trip back to Rhyl and the casualty was transferred to an ambulance back at the station after the boat returned at 1445. AWB crew paged to an 18-foot day boat with 3 people on board, about 1 mile out from Rhyl Harbour. They had engine problems after a day’s fishing, and the rudder on their boat was faulty. The AWB launched and was on scene within 10 minutes. The people on the board had raised their anchor and so their boat was very near the shallow sandbanks off Rhyl when the lifeboat arrived. The boat was towed out of the shallows until the casualty could be repositioned alongside the lifeboat for the return to Rhyl harbour. This was done and the casualty was taken under the new lifting bridge and returned to the launch slipway safely to the harbourmaster and waiting coastguards. The lifeboat then returned to station by 1830. The AWB was put on immediate readiness to assist with the evacuation of a woman at Towyn / Pensarn. AWB crew paged after a windfarm support vessel reported to Holyhead Coastguard that they had engine problems, and required assistance. The AWB launched and had 7 miles out to run. As the AWB was proceeding, another windfarm support vessel managed to get a tow on the disabled vessel, and begin a slow tow towards their home port of Liverpool. The lifeboat arrived alongside the same time as a third windfarm vessel, and the lifeboat stayed near until it was established that the tow was coping. As there were enough vessels around, the lifeboat was released by Holyhead Coastguard, and returned to station at 2100. The AWB crew were paged after Holyhead Coastguard received a radio call from a windfarm vessel about 7 miles out from Rhyl. The skipper had seen a “blip” on his radar screen, indicating an emergency operation of a radar “SART” (search and rescue transponder), somewhere around the windfarm areas.The lifeboat launched and proceeded to the Prestatyn area about 3 miles out, and whilst they were off Prestatyn, also saw the SART “ping” on the lifeboat’s radar, and were able to pinpoint the general location of the vessel where the signal had come from. Holyhead coastguard were informed, and after further radio broadcasts, identified that the blip had emanated from a large vessel as it was testing its emergency facilities, but had not informed the coastguard of the fact. As all was well, the lifeboat was stood down, returning to station at 1140. Both boats were launched after a 10m wooden private fishing boat suffered engine problems coming out of Rhyl harbour. The ILB launched first and succeeded in getting a tow on the boat, but the ebb tide proved too strong to tow the boat back into the harbour, and so the AWB took over the tow, safely delivering the vessel and it’s 2 occupants to the outer pontoon in Rhyl harbour. the service was completed by 1225, and the boats returned to station by 1305. Rhyl AWB crew were paged to launch to rendezvous with a windfarm support vessel 6 miles out that had a sick worker on board with breathing difficulties. The vessel was making for Rhyl as part of the rescue plan agreed with the windfarm operators. 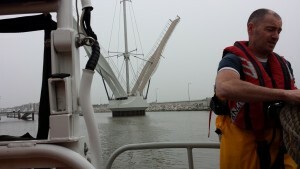 The boat launched and met up with the windfarm vessel, and a successful transfer of the casualty was undertaken. the lifeboat immediately returned to Rhyl beach and the casualty was handed over to ambulance personnel on return to the station at 1120. The AWB was put on standby should it be necessary to assist the ILB on service to a boat wedged under the blue bridge parapet. See ILB page for details. 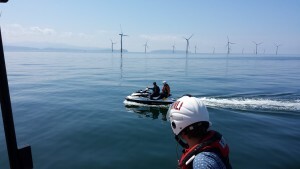 Holyhead Coastguard called the AWB to go to the aid of a Jet-Ski which had engine problems, about 6 miles out, to the North-East of the Rhyl Flats Windfarm. The AWB was attending Rhyl harbour Open day, and so was away within minutes. The Jet-Ski was located and it was found that the engine management system had shut down. The crew assisted the owner to look at the engine, and managed to get the Jet-Ski into a rescue mode which allowed the craft to be driven at about 5 knots. The lifeboat then escorted the Jet-ski back to Rhyl, arriving there at about 1415. Both boats brought to immediate readiness for a capsized Kayaker off Pensarn, Abergele. Original reports to Holyhead Coastguard had put the kayaker about 1 mile out, but subsequent 999 calls said the man was closer inshore. The man had managed to get ashore safely and both boats were stood down at 1535. Both boats were launched after a windfarm support vessel returning to the port of Mostyn recovered an empty inflatable with an oar and a used can of beer inside. The boats proceeded to search about a mile offshore between Prestatyn and Talacre and on the exposed parts of the North Hoyle bank offshore. Rhyl local coastguard team was also alerted, and proceeded to the Point of Air to check with people on the beach if they had seen anything. As the boats were nearing the Point of Air lighthouse, Rhyl coastguards reported they had spoken to a group of youths near the lighthouse, and they had admitted the inflatable was theirs. They had been out in the dinghy, and had got into trouble, being swept out to sea. They left the dinghy and swam ashore, 1 of the youths having great difficulty doing this. the coastguards asked if all were well and accounted for, and the party said they were all OK. The search was called off, both of Rhyl’s boats returning to station at 1900. The local coastguards gave the party a strict lecture on sea safety, and then returned back to Rhyl. Both boats were called out to assist with a speedboat about 2 miles off Rhyl. The 5 anglers on the boat were well equipped, but had suffered engine failure on the main and auxiliary engines. The AWB launched first and met up with the casualty, who was at anchor. The 5 anglers were transferred to the lifeboat and a crew member was put aboard the casualty. A tow was set up back to Rhyl harbour. On arriving at the harbour, the tow was transferred to the ILB back to the public slipway in the harbour. The AWB landed the 5 anglers at the inner pontoon in the harbour. Once all was safe, the lifeboats returned to station at 1700. The AWB crew were paged after Holyhead Coastguard reported an EPIRB ( emergency position indicating radio beacon) signal had been activated, indicating possibly someone in the water, or a vessel in trouble. Initial calculations were that the signal was coming from an area to the North-East of the Rhyl Flats windfarm, directly out from the boathouse about 5-6 miles. The lifeboat launched and proceeded to that position, but no signal could be heard or detected on the boat’s D/F (direction finding) system. A passing windfarm support vessel reported they could detect a weak signal from around the Point of Air lighthouse, and so the lifeboat was directed to that position. Again, no D/F signal was located. Further re-calculation by coastguards then decided the signal was probably emanating from around the Liverpool docks area, and so the lifeboat was stood down, returning to station at 1500. AWB crew paged to launch and meet up with a windfarm support vessel transporting an injured engineer from the windfarms towards Rhyl. The 2 vessels met up and a successful transfer of the casualty was made, together with another engineer as buddy. The man had been given casualty care on the windfarm vessel, and this continued on the lifeboat. The AWB then went into Rhyl harbour and the casualty was transferred to an initial response ambulance and taken to hospital. The lifeboat remained in the harbour until there was sufficient beach at the boathouse to recover. This was done and the boat was re-house at 1510. AWB requested to launch for a medical evacuation of a male from the accommodation boat “Wind Solution” servicing the offshore windfarms. The boat was just about to launch when Holyhead Coastguard reported the person was being transported by a support vessel to Liverpool, over an hour’s passage away. The lifeboat was therefore stood down and returned to station at 0220. Classed as standby. Holyhead Coastguard request the boat to come to immediate readiness at the water’s edge, to assist in locating a permanent signal on VHF channel 16, blocking the calling and distress channel to other users. Llandudno Lifeboat was tasked to do the same, together with various coastguard mobile units. The lifeboats used direction-finding equipment on board, and Holyhead coastguard then ascertained the signal was coming from the west of the Great Orme towards Moelfre, and so the lifeboats were stood down, Rhyl lifeboat returning to the boathouse at 1140. Classed as a standby only.